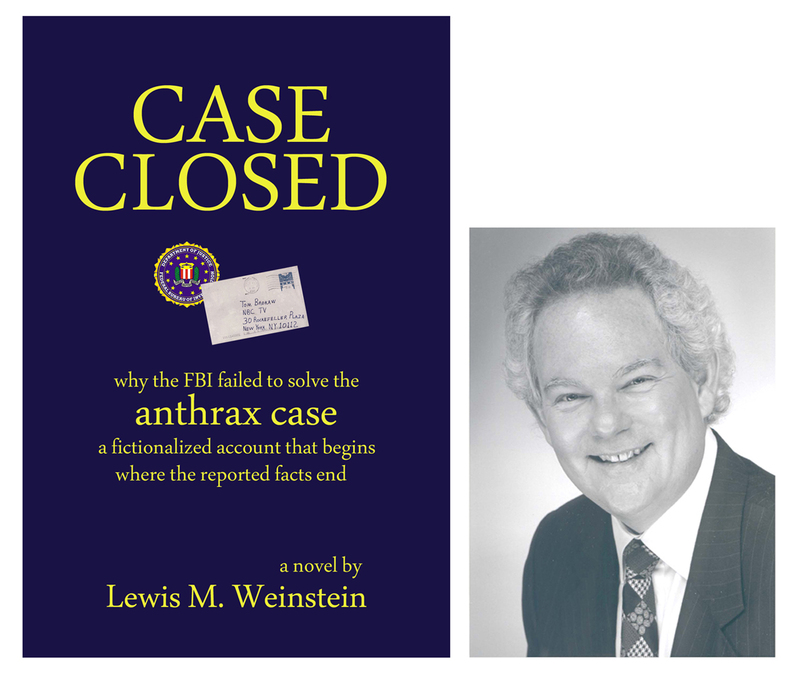 * reader comments about Lew’s anthrax novel “CASE CLOSED” « CASE CLOSED … what really happened in the 2001 anthrax attacks? CASE CLOSED reads fast and well. It could have happened just the way the author said. Full of intrigue mixed in with almost current events. The real people are just behind the fictional ones. The author states loud and clear that this book is fiction. But, anyone who has witnessed the last eight years of American history sees great similarities in the underhanded way the last Administration dealt with issues and the way this “fictional” Administration worked. I never have given much credence to conspiracy theories but the investigation of the Anthrax attacks makes one stop and really think about it. Weinstein raises some very interesting and disturbing theories. Despite the troubling reality of the subject matter, it is a thoroughly enjoyable and illuminating read. Responsible Americans who believe in holding our government accountable for its actions should read CASE CLOSED to be more informed of the facts of the case, regardless of whether they come to agree with the author’s theory. Fast Moving and “real” intrigue … When you realize that the book is based on real facts, it makes it that much more exciting. At times it seems unreal that we actually lived through these times. It makes it really close to home. The whole Anthrax episode is unquestionably a dark moment in American history. But what makes it fascinating is how it was handled (or should I say mishandled) by the administration and the various agency involved. The book is a must read for anyone who wondered what really happened? Who did it? and why?” and finally, why didn’t they tell us the truth? You will not want to stop reading … Lew Weinstein addresses this case with the pen of a highly skilled investigator. As the facts develop, and the characters weigh in, the story becomes an engaging and thought provoking ride that you will want to stay on until you know the truth. The questions asked here stretch the seams of terror with unbelievable possiblilities. A must read for anyone wondering how the anthrax scare could have happened in our own back yard. Attack from Within … This scary scenario is as close to truth as fiction can come. The plot is about anthrax attacks, a biological insurgency that doesn’t involve guns, bombs, or armies. Lew Weinstein is a meticulous researcher and a determined storyteller. This book will keep you up at night — reading, then worrying. it is really a super premise. I’m very impressed with your ideas and storytelling, as always. fascinating and scary. I don’t doubt your supposition for a second. You sure know how to build and keep the suspense going! great first chapter. Gets right into the matter. a fast moving book. I also suspect that the FBI was prevented from following up all the leads in this case. as a journalist, I have followed the case closely since the beginning … (your story is) close enough to most of the facts to make for a ripping yarn. I’ve followed all of this closely for many years. I would be surprised if some of the conversations you have written about have not taken place. Especially with respect to DoD taken one on the chin for the FBI. you have captured the intensity of what may well have been happening behind the scenes. It almost doesn’t matter if your ending is factually correct – something was happening that we still do not have the answers for. I think you are dead on about the significance these anthrax attacks had (and still have). but have been effectively gagged. Good attention to detail here on the driving to Princeton. You are perfectly correct that bloggers published details on how this would have been impossible for Ivins and a few days later the FBI changed their story. This seems to be a pattern – they make a statement, see how it flies, then adjust accordingly. The Chairman and Ranking members of the Senate and House Judiciary Committees have more information.